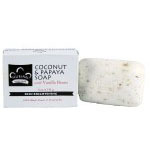 Sweet-scented and nutrient-rich, Coconut & Papaya Soap pays homage to the bounty of natural tropical ingredients. Coconut Oil, high in vitamins, minerals and fatty acids, is an excellent skin softener and protector. Papaya contains papain, a naturally occurring enzyme, used for centuries to gently dissolve dead skin cells, loosen pore blockage and stimulate circulation. Qty: 6 pack - 5oz bars.